Telebabad: "Feast of the Black Nazarene 2009"
"Feast of the Black Nazarene 2009"
On January 2, 2009, the Minor Basilica of the Black Nazarene decided to change the route of the procession of the Black Nazarene of Quiapo. Instead of beginning the procession at 3pm. From the Quiapo Church, the procession was scheduled to begin from Jose Rizal's Park in Luneta at 8:30AM, going through wider streets towards the Quiapo Church. A healing mass is also performed at 8:30AM, led by his holiness, the Roman Catholic Manila Archbishop, Cardinal Gaudencio Rosales. The Quiapo Church Rectory has decided to change routes to prevent injuries and deaths that has happened in the previous years due to the large crowds and stampede of the procession. However, on the day of the procession of the Black Nazarene, the older route was still followed due to many devotees who has decided to pull the ropes of the carriage towards the original route which encircles the Quiapo church. The new route was followed only up till Arlegui street, after which many of the Quiapo devotees took charge of the carriage and pulled the carriage ropes towards the original route of the procession. Many of these devotees has recently complained to the police officials because they believe that the Black Nazarene's passing towards their area results in their numerous blessings and good luck, many of whom are financiers and patrons of the Quiapo church. 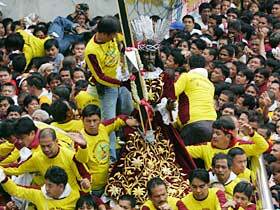 The Minor Basilica of the Black Nazarene in Quiapo has also decided to move the replica statue of the Black Nazarene to San Agustin's Cathedral in Cagayan De Oro, in the Mindanao island, so that Nazarene devotees from Mindanao may not have to travel to Quiapo, Manila for their pilgrimage.